Dec 26, 2015 / Comments: 5 / Goodbye Gustav! On Monday, Dec 28th, 2015 from 12 to 1 pm MET there will be again the opportunity to say Goodbye. Further informationen regarding memorial gathering to be announced soon. Our beloved friend, husband, dad, teacher and brother Gustav Vigneshwara left his body on Christmas day, Dec 25th, 2015 at 3.38 pm MET in Kassel, Germany. He was surrounded by family and friends, immersed in bhajans and love. Gustav brought so much joy and love to all of our lives - not least through his music. The bhajans touch our hearts so deeply. He was a bright star and a best friend to countless many blessed people. We want to express our gratitude for Gustavs love. Especially during these last weeks of his life we’ve experienced so much beauty with and through him. He is smiling in death as he was in life. We - his family - are in peace and happy for him to be free. Next Monday, Dec 28th there will be the possibilty to say goodbye and also later memorial gathering is planned. Further details will be announced soon. We opened up this Blog where we will post further updates regarding funeral and memorial gatherings. Who wants to stay informed please subscribe to the Blog (on the upper right corner “Follow Blog”). 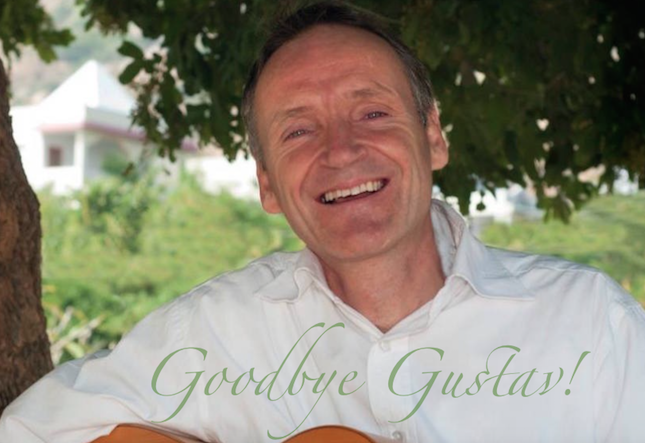 Dear Sabeena Mira and Govindan We are thinking of you and sending you our love for the passing of gustav. He is a special man and so much part of our memories at the ashram and the courses. Dear Gustav, We loved your sense of fun and your pure devotion. Sabeena was your perfect partner. Thank you for all the very powerful healings you both brought to ourselves and our home area on your visit to the U.S. Godspeed, Gustav. With love, Richard Angel & Kearin O’Hara. Denver, Colorado, USA. Dear Divine Friends, On Christmas Day, our dear friend and soul brother, Gustav Vighneshwara, left his body after a long illness. He was surrounded by love and joy and had a smile on his face as he took his final journey and was liberated from his body. We are happy that his soul is free to fly high now and even as his spirit lives on in his music and in our memories we will dearly miss his physical presence among us. We were long-time friends with Gustav and his family and shared so much during our sixteen years of friendship. In the early days of Swami’s mission, probably 1999, Gustav arrived at the ashram with guitar in hand. Swami began calling him ‘Guitar Man’ and soon asked him to sing. Swami really loved music and especially loved Gustav’s music. No doubt it brought Swami great joy. It certainly melted our hearts. After a time, Swami began having Gustav sing before he gave a talk either in the ashram or on his travels abroad to America or Europe. Eventually bhajans became an important part of Swami’s healing mission. Gustav made an impression in the ashram from the very beginning. On one of his first trips there, he went to noon aarathi before leaving the ashram. There were only a few dozen visitors there then. After aarathi, Swami sat in his swing as all the visitors were getting ready to leave. The cars, which at the time could drive right up to the Mandir, were all lined up ready to go. As the people filed out of the Mandir saying their goodbyes and loading their belongings into the cars, Nityaananda was called to come to the Mandir urgently for a medical emergency. That was the first time he met Gustav. We have many beautiful memories from those beginning days at the ashram. Each night from midnight to 2 am he sat at the dhuni singing to Swami under the stars in the open sky. Gustav’s voice, and the strumming of his guitar, was carried throughout the ashram by the wind. Not only Swami’s ears, but ours too, were filled the bliss of Gustav singing. It was heavenly. They were magical nights, meditating and listening to truly divine music, not wanting the night to end. There are no words to describe the happiness his music created in the soul. Our beloved ‘Guitar Man’ sang for Swami by the dhuni every night for years. This was a part of his training. Knowing Swami’s love of music and Gustav’s heartfulness, it undoubtedly brought great joy to Swami –not only then, but throughout Swami’s life. We also got to witness the master’s unique way of opening and developing Gustav’s channel for music. Gustav had a gift which Swami nurtured and developed. He became Swami’s instrument to create a unique form of healing music. Under Swami’s tutelage, Gustav gave form to the style of music that Swami heard in his head. Soon, singing bhajans became a daily part of the ashram schedule and will forever be linked to Swami. Whenever you hear one sung, Swami’s presence will be felt. This was a blessing that Gustav helped to bring to the world. No doubt the Man of Love sang through Gustav. And no doubt our beloved ‘Guitar Man’ is in Paradise asking the Man of Love’s help on our behalf now. We are sure in the days ahead when we sing bhajans we will experience it. Jesus’ voice will sing through us. We’ll know Gustav had something to do with it. God Bless you, Sankirtanacharia. Thank you for demonstrating through your life that the secret to making beautiful music is a pure heart. With love and gratitude for the gift of your life to us and to the world. Your soul lives on in the music and in our hearts.